Simple crockpot chili recipe that’s made in the slow cooker! This is the easiest, tastiest way to cook chili in a crockpot. When the weather cools down, it’s hard to beat chili for an easy, filling meal. 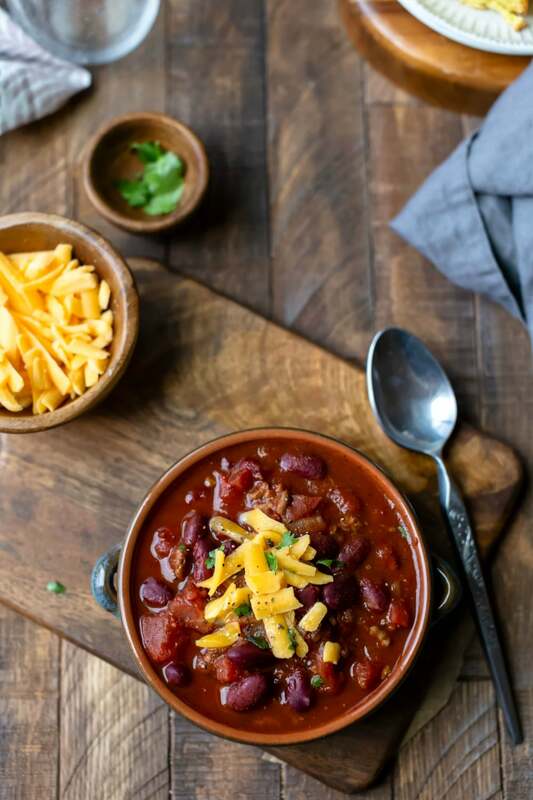 This chili is made in a crock pot so it’s super simple and super tasty! 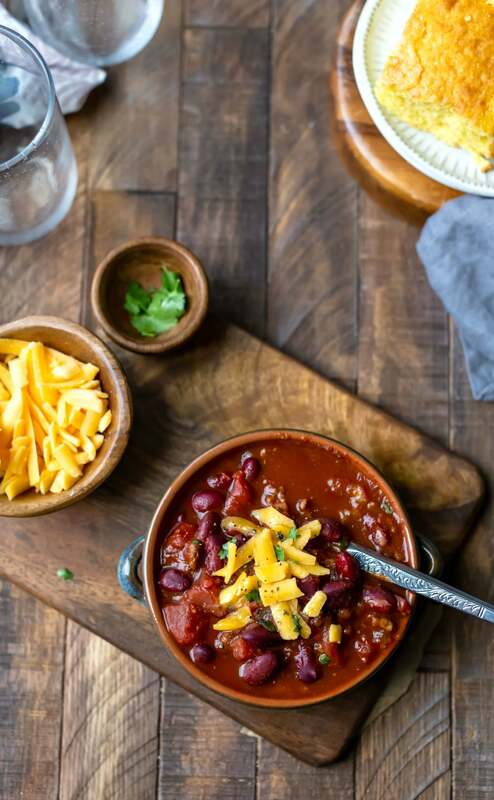 This crockpot chili simmers all day in a slow cooker, so you can toss everything in, let it cook, and come back to a delicious, hearty dinner. It’s so easy to cook chili in a crock pot! Start by browning the ground beef, then saute onion and garlic, and add all of the ingredients except for beans. Cook, and then stir in beans to warm through. I like to serve chili topped with cheese. Green onions and sour cream are also common toppings. Crackers and corn bread are both great alongside chili. When I lived in Iowa, cinnamon rolls were commonly served alongside chili. So, enjoy what you like with chili! 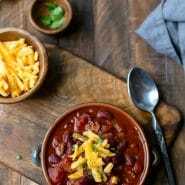 More slow cooker chili recipes! If you’ve tried this slow cooker chili recipe, don’t forget to rate the recipe and leave me a comment below. I love to hear from people who’ve made my recipes! You can SUBSCRIBE to receive my latest recipe newsletters or FOLLOW ME on FACEBOOK, INSTAGRAM and PINTEREST for even more delicious food. Drain ground beef and return to pan. Add onions and garlic, and saute, stirring regularly, for 3 minutes. 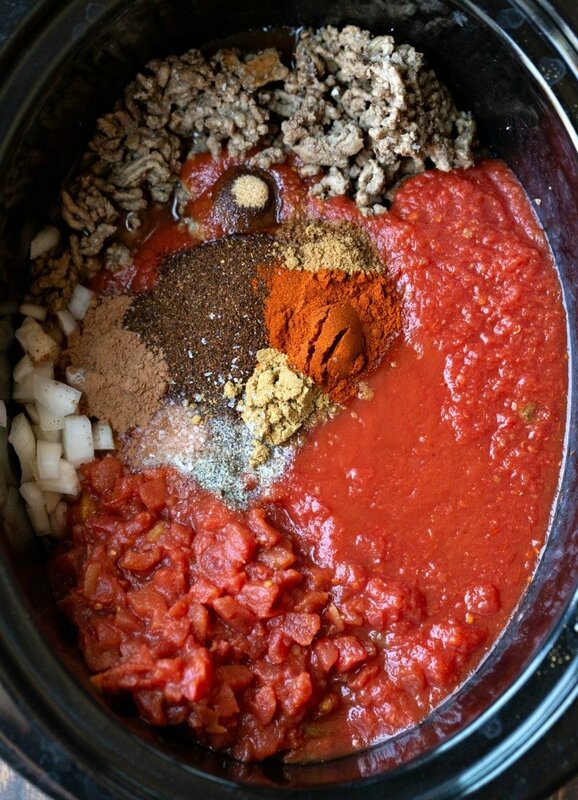 Add ground beef mixture to slow cooker along with remaining ingredients. Stir all of the ingredients except beans together. Cover with and cook on LOW heat for 5 - 6 hours. Stir in kidney beans and allow to heat through, about 10 minutes. Can’t wait to try this! I make your bbq chili and love it. I made this chili, it was really good! I added more chili powder to make it hotter, everyone liked it. Thanks!